Everyone uses Salesforce differently, and we understand that here at Drift! 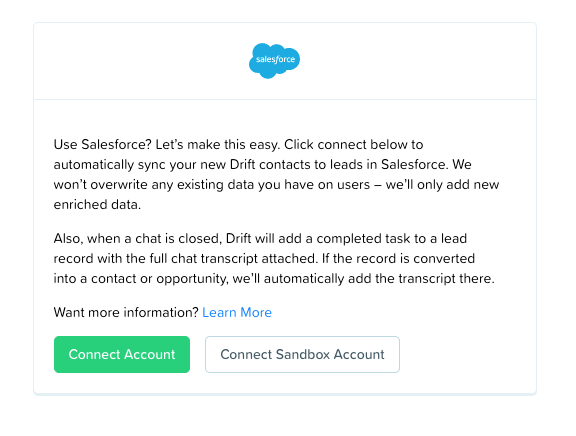 We want to make it easier for you to be able to test out the Drift integration in a test environment before going all-in with your Salesforce account, so we've allowed you to connect your Salesforce Sandbox account in Drift. This is a great way to make sure that the Salesforce Attributes you've set up in Drift match the corresponding fields in Salesforce! This is also a great way to make sure that the integration is working as expected and passing the correct conversation data over from Drift into Salesforce.